Went to the showroom and workshop of Lucio Bittencourt today! What an honor. Thanks Andreia Sato! Picture(s) later. I was too gobsmacked¹ to remember to take one. I was so gobsmacked that I said only two sentences for a while… We walked into the showroom and I said, “oh my god!” then I said, “Muito obrigado por abrir seu estúdio para mim, porque eu adoro o seu trabalho.” and that was it for my Portuguese AND English. [Really wish I remembered to take pictures.] Just imagine a large room FULL of your favourite things ever. 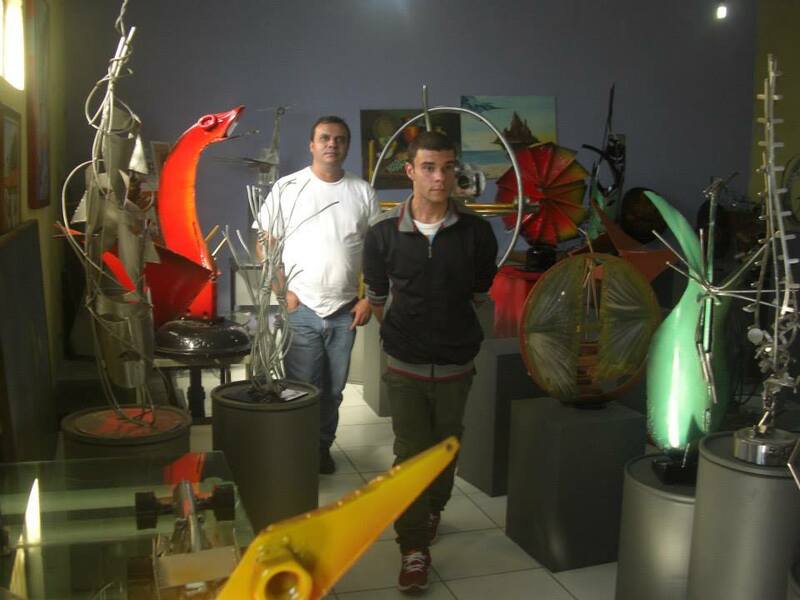 Policarpo & Rodrigo in the Showroom. Picture courtesy of Andreia Sato. Of course, I touched everything, I got to choose two pieces for the ‘símbolos espirituais’ portion of my exhibition/installation – can we say overjoyed and able to speak enough to say, “Este e aquele. Você não entende que eu adoro seu trabalho!” I then got to choose a GIFT for myself! I managed not to cry… barely. 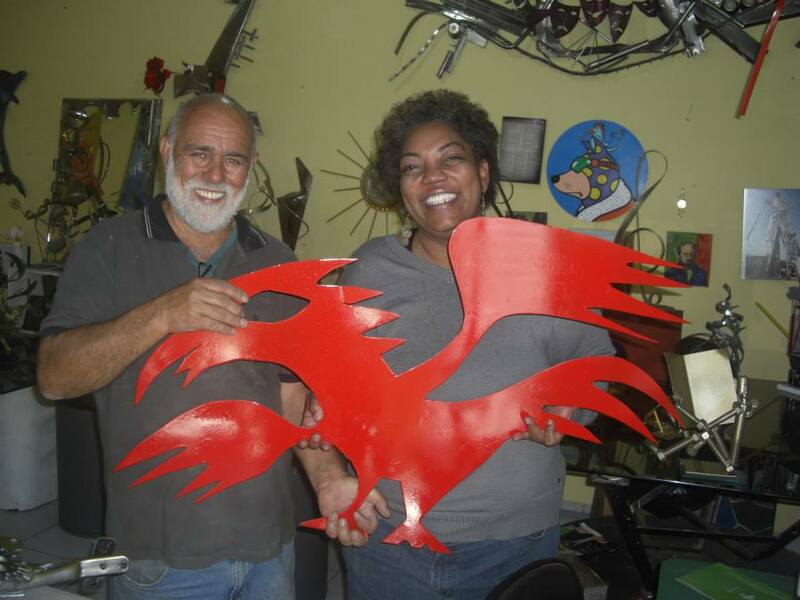 I am now the proud owner of the bright red ‘fênix’ – a wall sculpture. Fênix do Lúcio Bittencourt – Can my smile be any bigger? Um… as I picked up the steel sculpture and felt the weight of it, I wondered how I was going to get it home. ¹Speaking of gobsmacked, The person at the cash register where we went for lunch today recognized Andreia, then by default Policarpo and me from our pictures in the paper. We are apparently celebrities.